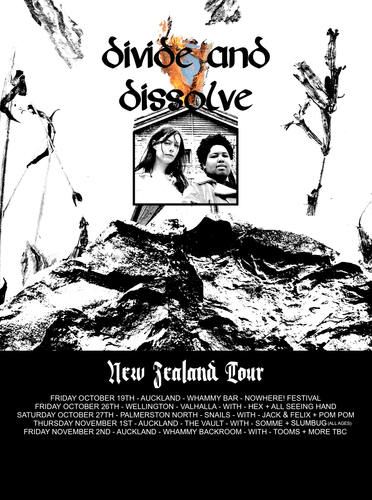 Politically charged Australian doom/drone duo Divide and Dissolve are returning to Aotearoa for a five date North Island tour this October and November, following their jaw-dropping support shows for Unknown Mortal Orchestra in early September. The band's art practise includes decolonising, decentralising, disestablishing, and destroying white supremacy, and they have been making some serious waves in Melbourne's underground since dropping their scorching debut Basic in 2017, casting low end-laden, tense soundscapes into the ears of apocalypse-ready listeners. Earlier this year the duo returned with their follow-up offering Abomination, an eight track sonic journey which expands on the band's foreboding atmospherics. - Keep off the street. - Smokers may smoke in the courtyard (through the small metal door underneath the stairwell in the practice room) and nowhere else in or around The Vault (smoking on Cross St close to the door will not be allowed). - Anyone behaving inappropriately will be removed (this includes physical or verbal harassment, racism, sexism, ableism, transphobia, disrespect to property etc).